We’re huge fans of crime dramas at VisitNland HQ. Obviously, ITV’s Vera is our favourite thanks to Ann Cleeves’ cracking storylines and an even better setting. However, our love of sleuths doesn’t stop there, we’ll watch everything from ‘Law & Order’ to ‘Diagnosis Murder’. So imagine our amusement as we watched a rerun of ‘Murder, She Wrote’ recently, and our beloved JB Fletcher (Angela Lansbury) told a fellow passenger that she was flying to London to research a grisly murder in Northumberland at the beginning of the 1900s. We nearly choked on our camomile tea! Once we’d calmed down, we realised we had discovered the perfect activity for Halloween: A Grisly Tales Trail through Northumberland! On 29th August 1791, William Winter murdered Margaret Crozier about three miles north of Elsdon. After Winter was caught, tried and hanged in Newcastle, Winter's body was hung in chains at the Steng Cross, an ancient boundary stone within sight of his victim’s home. 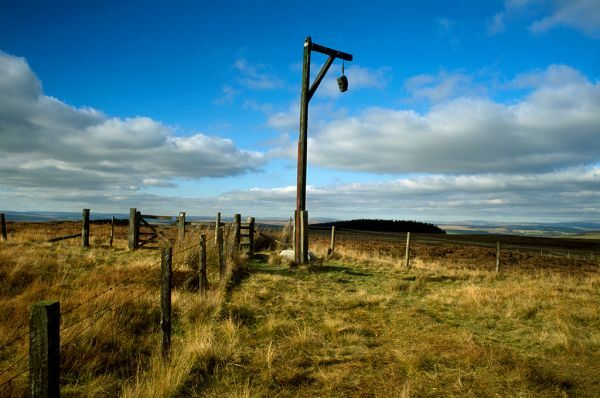 It is now said to be haunted by Winter, the last man to be displayed on a gibbet in England. To the north-west of Wallington House & Gardens in the Northumberland National Park. Aside from being one of the most well-preserved forts on Hadrian’s Wall, excavations in 1932 revealed one of the most enduring mysteries of Housesteads Roman Fort. Whilst investigating a house in the civilian settlement (‘vicus’) on the southern hillside, archaeologists found the skeletons of a middle aged man and woman under the clay floor of a rear room. This in itself was unusual enough, until they realised the man had a broken sword still embedded in his ribs. Little wonder the building has since become known as the "murder house". On Hadrian’s Wall in the Tyne Valley. Believed to be the oldest church in Northumberland, St Mary's Church in Woodhorn was built in the early eleventh century. It was decommissioned in 1974, but the churchyard is still intact and contains a weathered headstone of indeterminate age known locally as the ‘pirate’s grave’ as it features the image of a skull & crossbones. Whilst you’re there, be sure to keep an eye out for the Phantom Cyclist. Only ever seen at dusk, the figure is dressed in a miner’s work attire – not too surprising in south-east Northumberland – but the face is grey with hollow eye-sockets and black, rattling teeth. Near Woodhorn Museum & Northumberland Archives. Discover Northumberland's proud industrial heritage at a stunning historic site featuring art by the famous Pitmen Painters and an exciting exhibition programme.